We are the leading exporters suppliers and wholesalers of all kinds of Indian cooking spices. Mahesh Chand Varun Kumar is exclusive super stockist and Distributor of Reliance Kitchen glory spices in Delhi NCR. Since its inception in the year 1951, MCVK Group is engaged in import & export of Indian cooking spices like Betelnuts (both imported and Indian) Betel Nuts, Cardamom (Black/White) Pure elaichi dana, Jeera (cumin seed) Chironji, Cashews, Almonds, Pista, Cashews, Corriander (dhania), arecanut, Cardamoms, Cloves, Black Peppers, Fennel Seeds, Anardana, Dry Fruits & all kinds of raw cooking spices and more. It has earned a distinct position in spice industry owing to the top class products which possess the unique aroma and flavor, that you always desired. Our spices are not only known for the great taste they lend to everyday cooking but also have great medicinal value. cooking spices merchant exporters are glad to introduce ourselves as India's leading Spices Importers Exporters, Wholesalers and Buyers, we are also betelnut (supari) and dry fruits Importers Exporters, Wholesalers & Buyers, having a large customer base both in India and overseas. We, cooking spices merchant exporters, are quality suppliers and supplying good quality of arecanut to various companies in india. 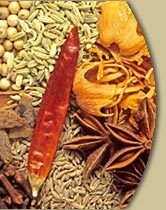 We, cooking spices merchant exporters, are having good exporter and importer certificate from cooking spices board of India, cochin and our group of dry fruits & cooking spices is also well known in indian dry fruits as well as in cooking spices industriess. And all kinds of raw spices . The unique quality products of the company have created stir in the global market especially the pan masala and mouth freshner manufacturers. The Company (MCVK Group successfully meets the domestic and international demand of spices to the complete satisfaction of its clients). We are leading supplier of spices, dry fruits, herbs and other grocery products for North India retail chain stores. Cooking Spices are well-known as appetizers and are considered essential all over the world. Cooking Spices add tang and flavour to otherwise insipid foods. Some of them Cooking Spices also possess antioxidant properties, while others Cooking Spices are used as preservatives in some foods like pickles and chutneys, etc. Betelnut, also known as Pinang or Areca nut. Betel nuts are often chewed for their helpful effects, which are caused by the relatively high levels of alkaloids in the seed. Chewing betel nuts is an important and popular cultural activity in many Asian countries especially in India. It is also used as an offering to God. Powder spices in the brand name of kitchen glory this is a product of Reliance India Ltd.
We, cooking spices merchant exporters, have tie-ups with reputed manufacturers and well kept farms & plantations that assures top quality of the procured food products. We, cooking spices merchant exporters, have a workforce of 10 skilled and highly competent personnel's who take into consideration even the minutest of details when it comes to quality and purity. Each piece of product is properly weighed and tested for quality, flavour, aroma, adulteration, etc. We have adequate warehouse facilities which ensures proper storing of products to maintain the quality. 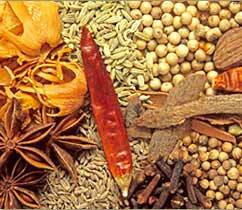 We, cooking spices merchant exporters, have become synonymous with quality products. The company's efforts are directed towards providing its esteemed customers with natural products of unmatchable purity. We use excellent quality raw ingredients that are thoroughly cleaned and then processed. 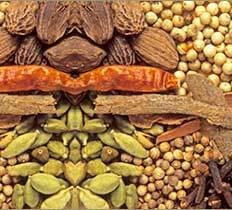 Our, cooking spices merchant exporters, manufacturing process is subjected to stringent quality checks. We, cooking spices merchant exporters, have an extensive distribution and logistics network that ensures timely and customized delivery. We, cooking spices merchant exporters, can also provide special packaging as per client's requirements for easy and safe transportation of items to the destination.We, cooking spices merchant exporters, are having a large customer base overseas,in middle east and Pakistan.